KCK Police are cracking down on gangs after seeing an uptick in gang-related violence and shootings. Kansas City, Kansas police are calling the arrests of four gang members a victory. Officers arrested the men overnight Thursday and recovered four handguns, four rifles, a pound of marijuana, gang paraphernalia. and towed two cars. This was in connection to a shooting earlier that day near 14th and Minnesota, in which two victims drove themselves to a hospital. "Anytime we can get guns and drugs off of the street, it's beneficial to our community. Last night we got quite a few guns and drugs off of the street," said Detective John Diaz. 41 Action News spoke with Diaz, who is a part of the police department's gang unit, about the prevalence of gangs in the city. According to Diaz, gangs are an ongoing problem. However, recently there has been an increase in violence and crime due to gang retaliation. "We've had quite a few shootings recently," said Diaz. "They're shooting over territory, shooting over drugs. Some have been robberies of drugs from one another and unfortunately it's retribution back and forth between two gangs." Police have determined a double shooting Thursday was gang-related. Detectives also believe a homicide two weeks ago, which killed a 15-year-old, was also gang-related. 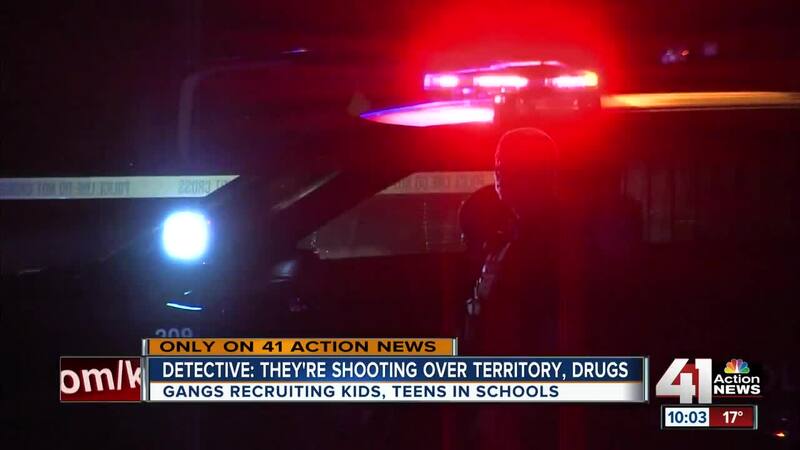 In KCK, most gang members are teens or men in their early-20s. Diaz said a lot of the members are recruited inside middle schools or in their neighborhoods. "They are moldable. You can pick out who you want and the kids from the school who you need to get to," he said. "We've tried to reach out to the parents for the kids that we know are in gangs or attempting to get into the gangs. They basically say they cannot control their children and they look for us to help and we help as much as we can. But sometimes it's just too late." Similar to national gangs, the ones in KCK adopt certain colors, wear specific clothes and have different hand signs. They also feud over territory, drugs and money. "That's why we have to get them while they are young, so we try to get into schools and we try and stop it early," said Diaz. "Right now with the influx of violence we've had, we're just where we have to make the arrests and stop the violence."